La Synagogue espagnole est considérée comme la plus belle synagogue d'Europe. Ne manquez pas les concerts tenus ici ! Située à l'endroit de l'ancienne synagogue du 12e siècle, appelée « Altschul » (la « Vieille école »), la Synagogue Espagnole a été construite en 1868 en tant que temple de l'Association du culte réformé. Le style mauresque exotique, inspiré par la célèbre Alhambra, souligne le caractère réformateur de la nouvelle synagogue et lui donne son nom « espagnole ». Ce bâtiment conçu par Josef Niklas et Jan Belsky, se remarque par son remarquable intérieur crée par Antonin Baum et Bedrich Münzberger. Frantisek Skroup, compositeur de l'hymne national tchèque, y a été organiste de 1836 à 1845 (à l’époque de l’Altschul). 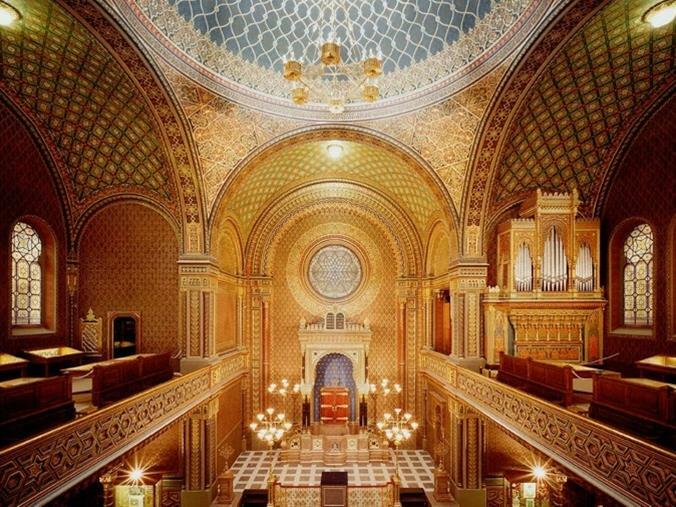 La Synagogue Espagnole appartient maintenant au Musée Juif de Prague, elle y abrite une partie de l'exposition, et des concerts populaires de musique classique et sacrée y ont souvent lieu. Vous trouverez dans la Synagogue Espagnole des sièges non numérotés. Votre billet garantit toujours le siège, néanmoins, nous vous conseillons de venir au moins 20 minutes avant le début du concert afin de choisir confortablement le siège où vous voulez vous asseoir. tram 17 - arrêt "Pravnicka fakulta"
Lieu magnifique. Les chaises ne sont cependant pas très inconfortables. il y a peu de place donc il rajoute des chaises sur le côté et on se retrouve derrière un poteau. Si non le lieu est très joli. Beautiful, significant space, not too crowded, good acoustics. From the outside of the building you have no idea of the feast for your eyes in respect of the interior of the synagogue. A really wonderful place. A beautiful venue, but a shame that the players were in an enclosed space surrounded by a decorative panel. This meant that they really couldn't be seen properly. The previous evening at the Klementinum we had been mere metres away from the players and it was far more enjoyable. Beautiful place. Great accoustics too. A beautiful venue but seating is not very comfortable. Wonderful acoustics, beautiful design, seating would become very uncomfortable if program longer than one hour. Beautiful venue with great acoustics. A truly magical evening in a beautiful setting with incredible musical talent! Highly recommend! 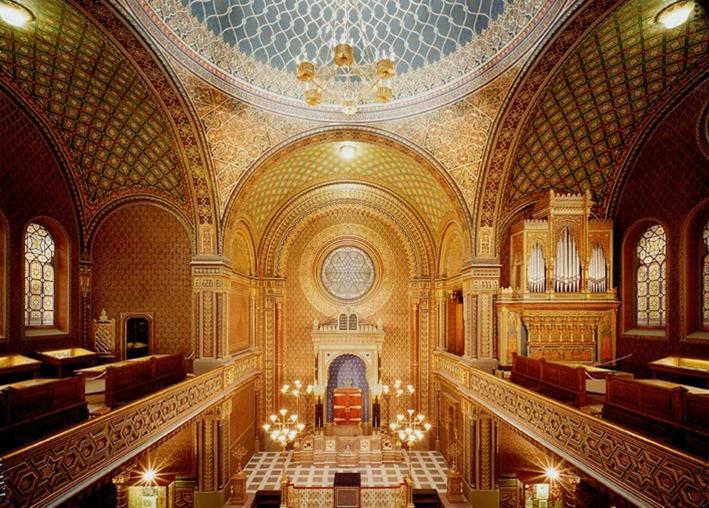 The location of the event is well-suited, the synagogue interior is amazing. However the seating on plastic chairs with noise each time you move has been disturbing and not very comfortable for the price paid. A fascinating and beautiful venue for this most varied and brilliant concert. The Spanish Sinagogue is beautiful and intimate, excellent for small events, like this convert. The sounds travels well, and the atmosphere is quite unique. Incredibly beautiful with amazing acoustics— really added to the magic of the evening!! While absolutely beautiful, it was quite hot with little ventilation. Fans would make a big difference. Beautiful building with great acoustics! The Spanish synagoge is impressive and has got a very good acoustic. Great acoustics and we were pleased we were able to see the inside of the beautifully decorated Spanish Synagogue. The outide of the building gives no clue to what it's like inside. The Spanish Synagogue was beautiful and it was very nice to be able to appreciate the details of the synagogue while listening to lovely music. Beautiful venue. Warm! Acoustics were fabulous. After freezing during a concert in the Klementium Church it was quite comfy and of course the synagogue is amazing..
Amazing venue--a beautiful place to sit and look at while listening to great music. It was, however, unusually cold, given the weather and lack of interior heat, and I was frozen cold in a distracting way by the end of the concert. Beautiful venue with great acoustics, however the entrance process was terrible - people pushing and shoving to get inside, tickets were not checked properly, our group was totally separated by the lack of control at the door, the rush for seats was crazy and many of the extra seats were noisy and squeaked during the performance! Totally beautiful surroundings for a musical evening. The seating may not be as comfortable as in a purpose built theater but this is a small price to pay for the pleasure of spending an hour in such a stunning building and the seats weren't by any means uncomfortable. I also appreciated that the doors were open and the performance started punctually. Fantastic atmosphere. The Spanish Synagogue was a snug place, perfect for this concert.